I admit I’ve gotten sort of lazy since I now go from car to destination, as opposed to having to walk the streets of NYC. I had to re-read this to remind myself that it is okay to dress nicely as Catholics. Everything is a process and our growth in Catholicism is a process. Understanding the term “Marian dress code” is also a process. I became a Catholic through traditional Catholicism. My first Mass was a traditional Latin Mass, which blew me away. I fell in love with the Mass according to the 1962 missal and I fell in love with all things traditional. Because I was a Catholic in a family of Protestants, I didn’t know much about Catholic culture, since I never had Catholics in my family to emulate. And so, when I looked for cues on how to dress as a modest Catholic, my only role models were women who dressed so over-the-top, they were walking anachronisms. They called this manner of dressing a “Marian dress code”. I call it dressing Amish, but in all fairness, the style is closer to how Mormons dress. In the beginning, I thought if I wanted to dress modestly, I always had to dress in prairie skirts and dresses. 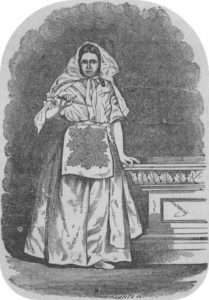 I knew several traditional ladies with exemplary spiritual practices. They explained to me patiently that women are to dress “Marian”. I grew to understand that included long dresses with long sleeves and collars that were buttoned up to the neck. Where in the world did they get this idea? “A dress cannot be called decent which is cut deeper than two fingers breadth under the pit of the throat; which does not cover the arms at least to the elbows; and scarcely reaches a bit beyond the knees. Furthermore, dresses of transparent materials are improper.” (The Cardinal Vicar of Pope Pius XI). 1. Marylike is modest without compromise, “like Mary,” Christ’s mother. 3. Marylike dress requires full coverage for the bodice, chest, shoulders and back; except for a cut-out about the neck not exceeding two inches below the neckline in front and in back and a corresponding two inches on the shoulders. 4. Marylike dresses do not admit as modest coverage transparent fabrics — laces, nets, organdy, nylons, etc. — unless sufficient backing is added. However, their moderate use as trimmings is acceptable. 5. Marylike dresses do not admit the use improper of flesh-colored fabrics. 6. Marylike dresses conceal rather than reveal the figure of the wearer; they do not unduly emphasize the parts of the body. 7. Marylike dresses provide full coverage — even after the jacket, the cape or the stole are removed. Now, all these recommendations are wonderful, but what does this translate to on the ground? If we dress in outlandish ways, that actually draws attention to ourselves and in fact we are then not being modest at all, are we? Modesty involves more than dress, it also involves behavior and wanting to wear something that screams modesty is not modesty in behavior. This needs to be said. In the current traditional Catholic movement, I noticed that the more plain a person dresses, the more modest they are considered to be. Young girls end up dressing in clothes that their grandmothers would wear. God does not require this of us. Interestingly, when I look at old European pictures of Catholics, I noticed the women were dressed elegantly in their Sunday bests. 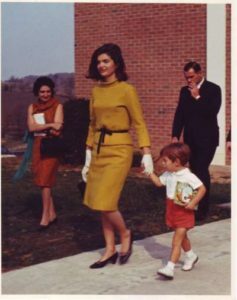 If we even take a look at pictures of Jackie Kennedy entering or leaving churches, we see how beautifully she dressed. I understand that the images associated with a Marian dress code derives from the apparitions of our Lady witnessed by many. However, let me ask this: If Mary lived in 2016, what kind of clothes would she wear? Does anyone actually believe she would be dressed like a woman dressed in the early first century? I would like to challenge all the ladies here to strive for a more elegant representation of modesty than what we mostly see as heralded on social media and blogs. We do not need non-believers to view Catholics as weirdos. A so-called “Marian dress code”, can also be elegant. Let us strive to dress modestly and elegantly. One book I’d recommend is Dressing with Dignity by Colleen Hammond. She has some awesome tips on modest, but elegant fashion. Who wants to join me in this challenge? Dressing with Dignity by Colleen Hammond. This list is a list in progress as I am always looking for new spots. Here are some I’ve found and please feel free to comment with places you’ve found. Amazon. Yes, Amazon! The black dress on the right, is on Amazon. H&M – H&M has a modest line now, but I’ve always been able to find modern tops and skirts at H&M. If you purchase through our site links, we might get a commission, at no extra cost to you. Your support helps us keep this site going. Thank you! I do love Colleen Hammond’s excellent book! It’s such an eye opener, a helper to one’s wardrobe of elegance. If Mary were to walk among us in 2016, I strongly doubt that she would be much concerned with “elegance” (except, perhaps, for special occasions, such as a wedding). Most of the time, she would blend right in with the people around her, just as her Son did, who was like us in all ways but without sin. She wouldn’t dress like a walking anachronism, nor would she dress like a prostitute (and I truly doubt that she would dress like Jackie-O). Rather, like her Son, she would take the form of a servant., dressing like the young mothers and the housewives and the poor women that she loves, the common women that we see in the supermarket and in the workplace every day, who wear “mom jeans” and T-shirts, waitress uniforms and office clothing. She almost certainly wouldn’t be wearing Chanel, unless she were on a special outreach mission to the “ladies who lunch” at the country club. “My soul doth magnify the Lord : and my spirit hath rejoiced in God my Saviour. Our Lady wearing mom jeans and t-shirts? I would think she would blend in, but in keeping with the wisdom of the Church as she is the mother of it’s birth. Cardinal Siri in 1960 (not even so long ago!) warned of the downfalls of women wearing pants (this was also supported by Pope Pius XI), especially tight ones, as is so common now. I hardly think Our Lady wouldn’t heed the wisdom of this prelate of the Church. I read his Notification concerning men’s dress worn by women some time ago, but it was only recently that the Holy Ghost enlightened me to really hear what he was trying to teach. We ladies are the key to how society goes and we cannot shut out the wisdom of the Church, even if it’s hard to accept. Our Lady would listen to the wisdom of the Church. She would obliterate this unisex mentality that has slowly been accomplished to corrupt women and ultimately crush the Church. You can read about it in the Permanent Instruction of the Alta Vendita, the Masonic blueprint for the subversion of the Catholic Church. They have picked women to be one of their three main tools. I, and my family, intend to subvert THEIR plan! I will not let them use me as a tool of evil. We ladies have to become to know and understand this evil in order to have the strength and courage to push back this plan. Your ideas along with some of the others in this thread leave much to be desired; you and some of the others obviously have a communist’s approach to that fact that we must all: act the same, dress the same and purposely flaunt modesty to show how good we all are. I don’t know about you because I am really no one at all; just a person” who is no better and no less than anyone else” on this planet; I glad in my ordinary status being “nobody’s nothin” because I could never be holy as you are. I like to dress in artistic fashion that is conservative and appropriate wherever I go because honesty starts at home; and not pretending to be holy in church! Modesty is a private matter between the person and ‘Almighty God”for your information! Modesty is not showing off how chase we are; when many who dress this way are hardly chase by their viscous comments made to women dressed nicely for church.If a women chooses to become a nun— then it goes in line with chastity and covering up because they have accepted being, brides of” Jesus Christ”. T shirts and jeans are a disgrace to wear in church and when I was growing up back in the early 60’s we went to church dressed in our best– in respect for “Almighty God’s” house not dressed flashy or trashy or like today an with anything will do attitude–( cleaning the garage cloths always pointing out to everyone in church how modest and kind we all are.”) Our Lord Jesus Christ was no servant and no underling to any authority other than”Almighty God” himself ! Yes He lived in poverty because his kingdom is not of this world and” Our Lady” lived in the same manner. Having a judgemental attitude about about men or women dressing elegantly and appropriately is obviously arrogant and jealous. Any person who is lacking in funds can find a neatly conservative way of dressing that is not sloppy by wearing a decent skirt and long sleeved blouse or an attractive dress ; and in addition men dressed in suits with a tie on Sunday. Our “Virgin Mother” would have dressed in her fineness for” Almighty God” in church if she could have; because” He” chose her as the finest vessel for” Our Divine Savior! She is ultimately the most” Magnificent Perfection” of extreme purity and beauty, not just an anything will do servant. “He also chose her because she is full of “Charity” with no malice against anyone but the thing in the pit! Modesty is not just a garment to be worn in church for affect. Modesty is like the Golden rule” treating others as you would have them treat you”. Your attitude toward Jacqueline Kennedy is typically rude and unforgiving and it shows how”un modest” people like you really are.This is all consuming pettiness and it does not matter what a so called Chanel suit is, or an outfit designed by Jacqueline Smith for K mart; it is all the same clothing! I do not believe that” Jesus” himself or” The Virgin Mother” would go out of their way to condemn Jacqueline Kennedy for wearing a mindless Chanel suit! I think that they would have shown compassion for the tragic price she paid in being so famous! And yes, Colleen Hammond has given us a great gift in Dressing with Dignity!! I join you in the challenge….may Our Lady guard us and Our Lord strengthen us and give a thirst for Truth! Let’s consider that perhaps God purposefully chose Mary to be born into the time and place she was because of, not in spite of, the dress habits of that era. Do you not think God could have chosen another time with another dress code? So, if he did purposefully choose that era, perhaps He is showing us clearly what womanly, holy dress should be. God in his mercy does not hit us over the head with this as a commandment, but ever gently shows us His way. In all her apparition, Mary appears in the ethnicity of the local people, but not in their mode of dress. Perhaps we should ponder that. unfortunately this post – while having very good intentions – is sort of a blunder. The Statement that our holy mother would dress to blend in is false. When our Lady of Guadalupe appeared to Juan Diego did she dress in typical Indian fasion? Nope absolutly not! So ladies please take that false premise out of your mind now….it is not true. Our Holy mother always appeared super modest. As Catholics we need to stop adopting the ways of the world to be accepted…….remember our home is in heaven. Our Lady of Guadalupe, did dress in indian fashion. I just attended a talk on Our Lady of Guadalupe. The picture includes elements of Indian culture. This couldn’t have been said better. Do you this Our Blessed Mother would change her beautifully modest way of dressing just so people didn’t think Catholics were “weird”. This article is mearly based on a Luke warm Catholics idea of modest dressing. Whose fingers, mine or my husband’s? Thank you for the lovely comment and article! FYI, the “numbered” guidelines were written by Fr. Bernard Kunkel and are his own interpretation of the Vatican Guidelines. I really don’t think the Blessed Virgin Mary would wear jeans, I made some research and found out That these type of clothing is considered pagan by the Holly Mother, in one of the apparitions to Verónica Luerken. We think it is normal because we have been so absorbed by these ideas for so long. I am twenty three and wear jeans but I want to start wearing midi skirts and dresses. I have been catholic my entire life and I dindn’t know That dressing modestly was so important, and I really understand why. I really wish more people knew this.